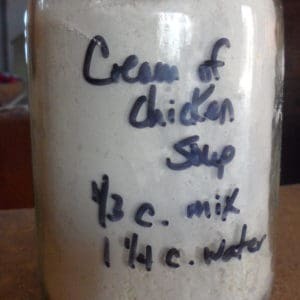 I first saw the recipe for making your own cream of chicken soup mix more than 10 years ago. 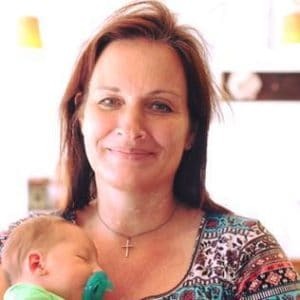 I thought it was a good idea then, but I never got around to trying it out, until we were trying to find ways to save money on our grocery budget. I can’t believe how much cream of chicken soup costs now. At Walmart it is $1.00 a can! Many quick easy casseroles call for cream of chicken soup, so I was looking for a good alternative. I found a recipe and decided to give it a try. I can’t believe I didn’t try it sooner. There are a lot of different types of chicken bouillon you can buy. Some of them have MSG and other additives in them, and some of them don’t. I use this chicken bouillon from Orrington Farms. It contains no MSG and is GMO free. Combine all the ingredients together and store in an airtight container. You can add spices or adjust the amount of spices, as desired. To prepare, combine 1/3 c. mix and 1 1/4 c. water together in a sauce pan. Whisk until smooth and slowly heat until thickened. One recipe replaces one can cream of chicken soup. What’s funny is that I never realized what a taste difference there is between the homemade cream of chicken soup and the store bought. Not only is the homemade less expensive, it is delicious! There is no comparison in the taste. The homemade version wins hands down. I have been using this homemade mix for more than three months now and won’t be switching back. 5 Comments on "Homemade Cream of Chicken Soup Mix"
When you say one recipe equals on can of cream of chicken soup, I assume you mean one can prepared with one can of water, ready to eat. So do you suppose that if you only add 1/2 the water (or maybe less? ), it would be equivalent to a can of undiluted soup? That’s a good question! Yes I mean it is the same as a can with one can of water added. I think if you added half the water it would be about the same as what was in the can. It would be very thick. Regarding your recipe for Homemade Cream of Chicken Substitute. I have also seen chicken bouillon powder. Do you think that would work better? I am going to look for MSG free though. Hi! Yes, chicken bouillon powder would work fine for this recipe. The granules I was talking about in the recipe look very similar to a powder to me…they are very similar in consistency. I wasn’t able to find MSG/GMO free at my grocery store, so I ordered it online. Thank you for all your great recipes!